The environmental approach in the humanities has become widespread due to the request of pedagogical and organizational practice. The spatial component can be diagnosed, built, or adjusted by measuring and controlling the social distance between the subjects of the educational process. The indicator of social distance is a diagnostic sign of trust and security in the educational process. The measured characteristics of physical space, including distance to objects, are used to describe the perceived positions in society and in relation to other participants of interaction. Contradictions and conflicts appear as a result of divergence in perceived social distances that determine the attitudes and norms of interaction between subjects of the educational process. The chapter showed that the conditionally unfavorable environment is characterized by the fact that perceived social distances are more important up to the preference not to see other subjects of the educational process. In a changing society, subject to the influence of objective processes, such as globalization, informatization, technological progress and social segregation, the study of the educational environment is due to a lack of theoretical provisions and practical recommendations that contribute to the effectiveness of psychological and pedagogical support and correction. Highlighting the significant characteristics of the environment allows minimizing the expenditure of resources on the functioning of the educational institution and focusing attention on key control points and on the content of training and individual support of students. The environment approach is a theory and technology of indirect management of the processes of the student's personality formation and development through the construction of the environment. 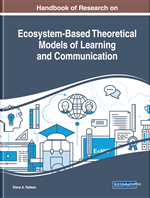 The environment approach in education is grounded methodologically in the works of Artyukhina A.I., Berezhnova L.N., Bibler V.S., Yasvin V.A. et al. Supporters of the environment approach suggest in the teacher's activity shifting the emphasis from interpersonal interaction with the student to the area of the formation of the developing environment, characterized by the parameters of comfortable objective space. M.M. Knyazeva, N.B. Krylova, V.A. Petrovsky, V.I. Slobodchikov et al, M.V. Klarin, Yu.S. Manuylov, V.V. Rubtsov, I.D. Frumin, B.D. Elkonin and V.A. Yasvin developed technologies and methods for designing the educational environment (Abramova, 1994; Slobodchikov, 1997). The educational environment has a wide spectrum of modality, which forms a variety of local spaces types of different, sometimes mutually exclusive qualities. Under the educational environment, we understand most often the functioning of a particular educational institution. To understand and evaluate the effectiveness of the educational environment, various parameters are studied. However, in connection with the designated subject of the study, we turned to works that focus on the objective characteristics of space. We believe that we can diagnose, build up or correct the objective-spatial component by measuring and controlling the social distance between the subjects of the educational process. The indicator of social distance is a diagnostic sign of trust and safety in the learning process.